In October 2012 Thin Lizzy announced that they would not be recording new material under the Thin Lizzy monicker. 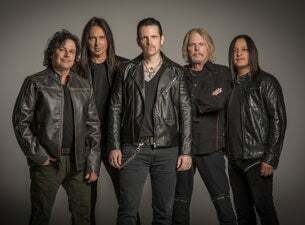 The last incarnation of the band – Scott Gorham, Brian Downey, Darren Wharton, Ricky Warwick, Damon Johnson and Marco Mendoza – would be looking to form a new project. Step forward Black Star Riders. Formed by Thin Lizzy alumni Ricky Warwick (vocals), Scott Gorham (guitar), Damon Johnson (guitar), Marco Mendoza (bass) with new addition Jimmy DeGrasso on drums (Alice Cooper, Megadeth, David Lee Roth, Suicidal Tendencies), Black Star Riders entered the studio in January 2013 to start recording their debut album. The result? A sound that retained that classic feel but is very much its own as well; the next step in the evolution of the Thin Lizzy story. Since then, the band have released two more studio albums, with their fourth – Another State of Grace – due this year. New tour dates will see the bamd come to London, Bristol, Cambridge and more this autumn.